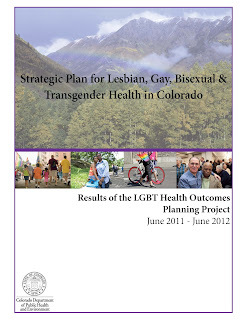 Today the Colorado Department of Public Health and Environment (CDPHE) releases the first-ever strategic plan focused on the health and well-being of Lesbian, Gay, Bisexual and Transgender Coloradans. With participation from more than 45 organizations across Colorado, the plan aims to reduce, and ultimately eliminate, health disparities faced by LGBT communities by removing unnecessary barriers and building new pathways to healthy living. Like the rest of the nation, Colorado’s LGBT population experiences higher rates of tobacco, alcohol and substance use, infectious disease, and depression. National and state research shows that many LGBT people face multiple obstacles in getting appropriate health information, prevention services and health care. To show support for the health and well-being of Colorado’s LGBT community, CDPHE invites all its partners and the public to attend the Denver Gay Pride Parade on Sunday, June 17, 2012 at 9 a.m. starting at Denver’s Cheeseman Park and ending at Civic Park.